Cauliflower is the hottest vegetable in the 2015 foodie scene! By hottest, I mean most popular, but it just so happens that this recipe adopted by Josie’s Organics is indeed HOT! 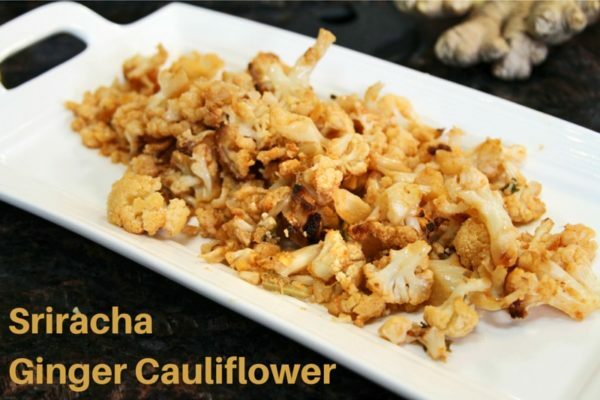 Of the hundreds of cauliflower recipes that have been popping up as of late, the sriracha cauliflower is one of my absolute favorites. It is a perfect side dish or appetizer for a family dinner! Feel free to use less or more sriracha, depending on how much spice you can handle! In a large bowl, combine the coconut oil, sriracha, ginger and salt. Add the cauliflower florets and toss to coat. Place the cauliflower on a rimmed baking sheet and roast 40 minutes until slightly browned. Stir with a wooden spoon halfway through and serve. Have you accepted the #ProduceMomChallenge? If not, check out the new interactive March calendar for fun recipes, nutrition facts, helpful tips, and more!